"Stereophonic recording differs from Binaural in that the microphone placements are selected for loudspeaker reproduction. Binaural properly applies to a two-channel system designed for headphone reproduction. It thus requires the use of two channels fed by microphones spaced about seven inches apart." Those magic 7 inches represent the average distance between a pair of normal human ears. it's the founding idea behind binaural sound. It is supposed to put the listeners perspective sonically where the sounds on the recording or broadcast originated. I consider it a subtype of stereo sound. Stereo sounds being if nothing else.. at least less specific. More here. It's strange, but binaural sound actually predates stereo. In 1881 Clement Ader installed pairs of carbon mics on a Paris opera stage for telephone subscribers to listen in. How is this separate from the evolution of stereo? It's not. They're inextricably linked. Every step in the evolution of stereo sound can also be claimed by the evolution of binaural sound. The only difference is snobbery. There is a gri-gri quality to binaural sound that stereo lacks. But let's get back to Emory. There was a lot of gri-gri to him as well. Emory created a record player with two needles meant to play records with two parallel grooves. 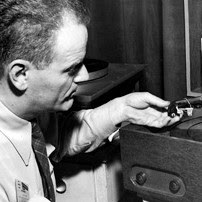 He founded Cook records in 1949 and eventually put out more than a hundred binaural LPs. His plant was based in Stamford Connecticut. Emory was using his personal brand recognition to hype a series of binaural LPs: Sounds of the Sea, Nightmare in the Mosque, Speed the Parting Guest. He demonstrated them at the Worlds Fair. They're all over eBay now for the kitsch. But there were also radio broadcasts were live like Toscanini, WQXR string quartet and the Godina opera hour. But this was 1952. stereo sound was entirely new in broadcasting. WQXR was achieving "stereo" by using it's using its AM and FM stations towers as separate Left and Right audio channels. Was it stereo, was it binaural? I don't distinguish a difference. Binaural enthusiast will tell you this was the first binaural broadcast. I think it's bunk. In 1925, on 5XX the BBC had broadcast stereo with the Left channel on medium wave and the right channel on long wave. That's 27 years before WQXR. WGN-AM and WGNB-FM did the same thing in 1952 just a few months before WQXR. All they're beating their chests over is microphone positioning in the source audio. It's bunk; clever bunk, but bunk nonetheless. The irony is that in the process of supporting the bunk idea of binaural audio the very educated and clever Cook actually made other developments. He made microphone and amplifier improvements that made it possible to record audio above 20,000 cycles, he even developed a process to press vinyl in a powdered form to reduce surface noise. Previous to this they were always pressed starting with a preheated puck of vinyl, a technique based on shellac 78s. He called the new technique “microfusion.” Sadly it didn't catch on. Emory Cook died in 2002 at the age of 89. Emory donated his master tapes, patents, and papers to the Smithsonian Institution in 1990. Obit here. There was a 10 inch Cook Binaural recording called, 'The D D D's of Binaural, as taught be Prof. Titus Moody', released about 1953. Does anyone have a copy they would like to part with? A quality dub of it would be OK, even a dub of EACH TRACK. I can make a usable CD of that. I'd like to hear that myself!